FRANCE: Arabian breeding started early 20th. century, with imported desert horses. Bred mainly for racing, they lacked the beauty and type of the Crabbet horses. French horses played a significant role in the development of the Arabian breed in Russia and Poland. POLAND: Imported purebred Arabians to establish an Arabian Stud farm. Originated mostly from Kehilian and Seglawi strains to breed the Arabian “type”, prettiness and refinement. Poland’s purebred Arabians date back to the days of the “Amber Trail”, the thoroughfare between the Black and the Baltic Seas. Polish Arabians are sought after, because they have more substance, yet they retain type and refinement. Polish breeding has always emphasized athleticism, and Poland is still headed in that direction. RUSSIA: Many ties with the Polish Arabians. The first Russian-bred imports to the U.S. and Canada were considered Polish, because they were imported from Poland, although they were born in Russia. Russian breeding concentrates on Polish and Crabbet lines, adding some Egyptian and French lines. The Polish contribution stems mainly from twelve Polish Arabian stallions and forty two mares which were taken to Russia during World War 2. SPAIN: Founded mostly on desert-bred, Polish and Crabbert imports, with recent additions of a few Egyptian lines. 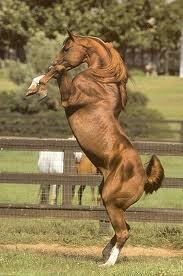 Spanish Arabians were bred mainly for and by Spanish royalty, and later by private and military studs. American Joseph Draper of California first imported four Spanish mares and a stallion in 1934, and in 1960 America rediscovered the Spanish Arabian. Breeds which have a large percentage of their origin tracing back to the Arabian are the Thoroughbred (descending from the importation of the Godolphin Arabian, Darley Arabian and Burley Turk between 1683 and 1730), the Russian Orlov Trotter, French Percheron, American Morgan and Trotter. 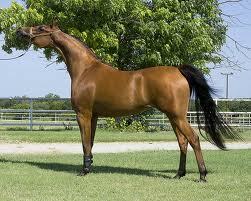 Arabian bloodlines are also found in Paints, Appaloosas, Quarter Horses, Warmbloods, Saddlebreds and Cape Boerperd. Because of their beauty, intelligence and stamina, Arabians have been the popular mounts of World leaders, such as Napoleon, George Washington, Genghis Khan and Alexander the Great.